Last year and early this year, social networking sites were flooded with complains regarding the over-booking, delays, cancellations and other forms of unfair experiences. 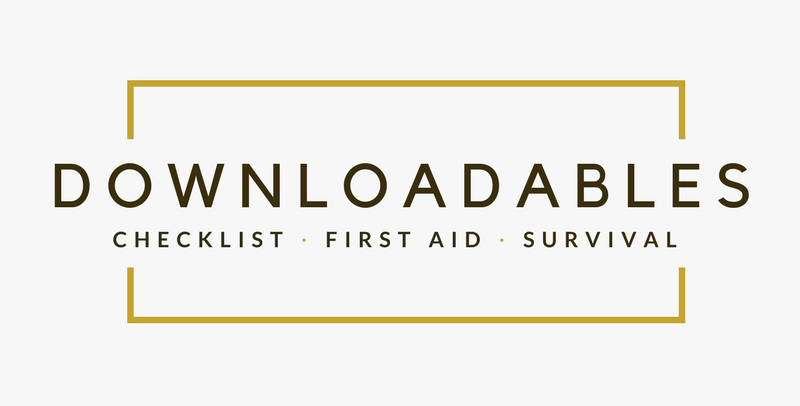 There were mountaineers, backpackers and travelers expressed their disappointments, as response, allow us to share the rights of every plane passenger on this post. 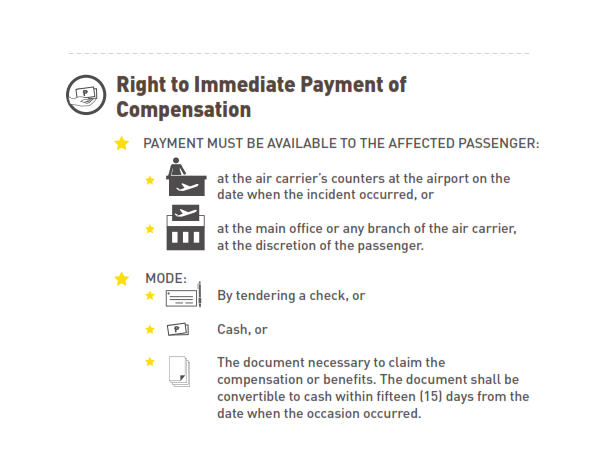 The passengers should be provided with information on the airline’s policies on refunds, re-booking, baggage allowance, and procedures for delayed or cancelled flights as well as government taxes and surcharges. In case of promo fares, the airline will also have to disclose how many seats are being offered. Airline passengers who arrive at the check-in area an hour before the departure of their flight will not be considered as late or a no-show. Check-in counters at international airports should be opened at least two hours before the time of departure. For other airports, check-in areas should be opened at least an hour before departure. Senior citizens and persons with disabilities (PWD) equal access to airline services and special assistance. The airline will not be held liable for additional costs of special assistance facilities or if it fails to extend aid if the passenger fails to inform the airline in advance of the need for special assistance. 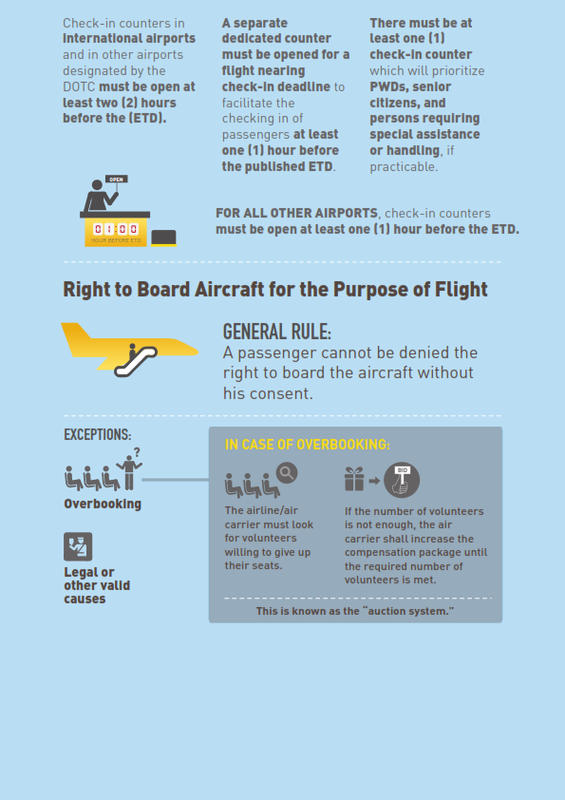 In case of overbooking, a practice wherein the airline sells more seats than the aircraft can accommodate, the airline company should offer compensation to those who give up their seats. 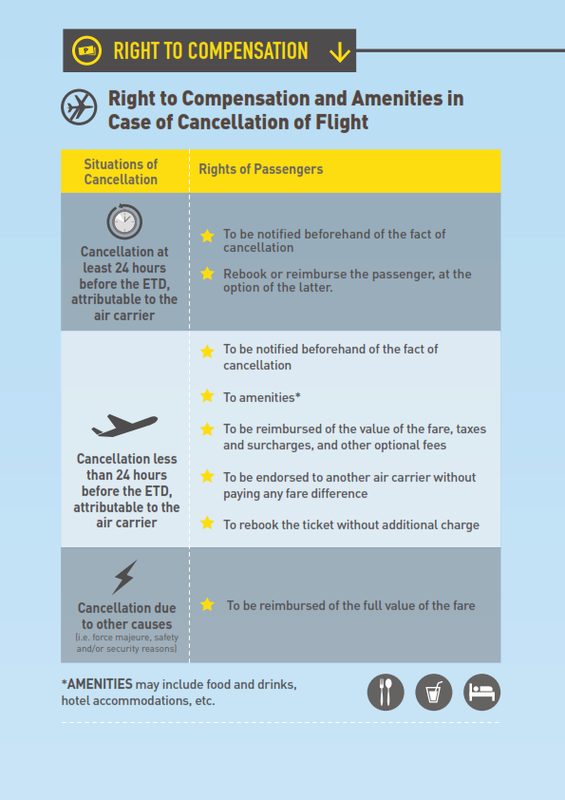 Passengers should be informed beforehand in case of flight cancellation and be reimbursed the full fare if the cancellation was due to force majeure, safety and security reasons. 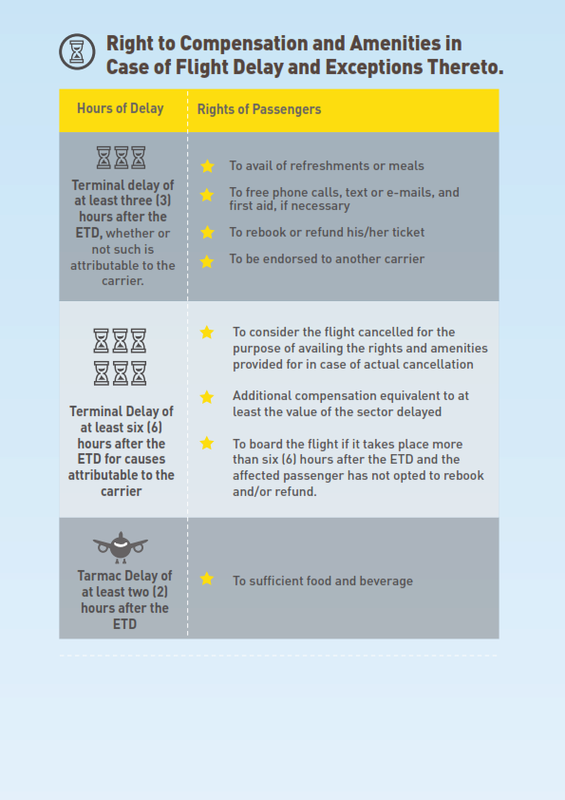 The airline company should provide free food, phone calls and email access and if necessary, accommodation, for passengers of delayed flights. Airline companies are also tasked to inform its passengers about offloaded baggage and ensure that their luggage is delivered within an hour after it reaches its destination. The airline will have to pay P2,000 for every 24-hour delay in delivering the offloaded baggage to the passenger. 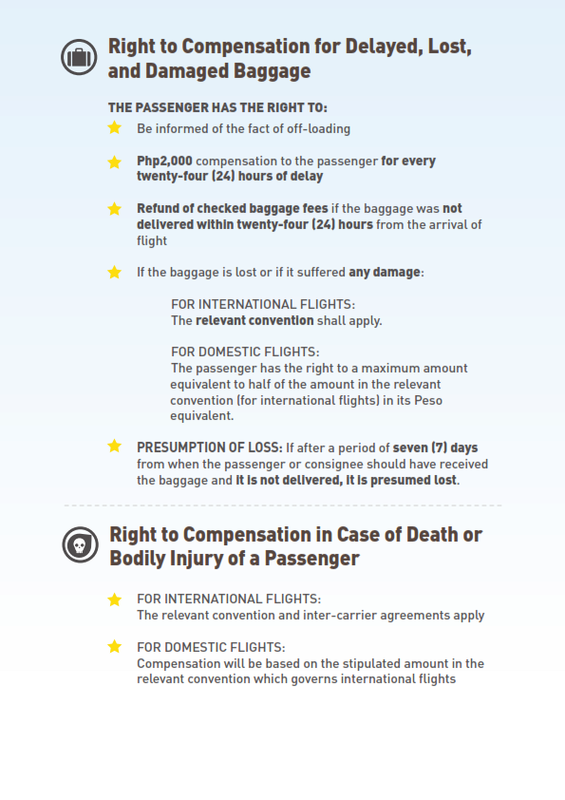 The passenger will be compensated for baggage loss if it is not delivered by the seventh day. According to some of the known House Leftists individuals or the Makabayan bloc, the "Bill of rights" is not sufficient to ensure safety, convenience and affordable travel for the public, and they want to put an end the “wanton disregard” to passengers. The leftist bloc in the House of Representatives passed House Bill No. 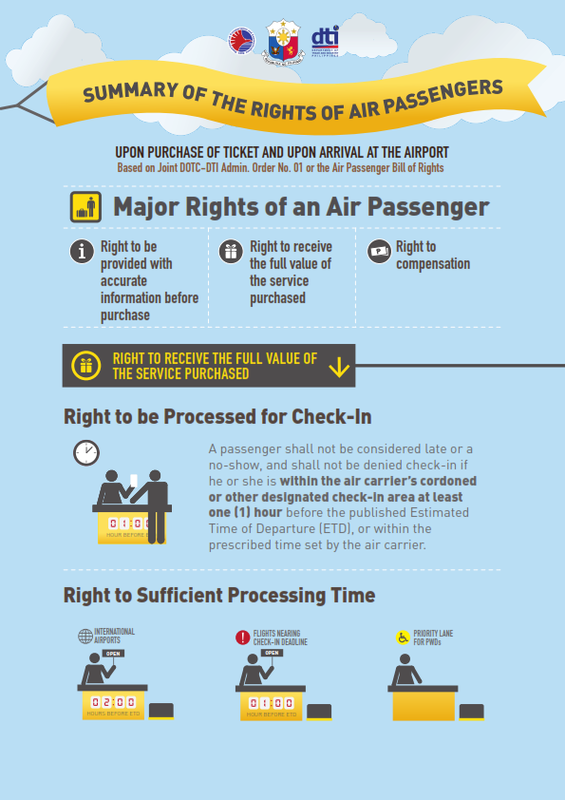 5361 or the Magna Carta of Airline Passengers’ Rights. What are my rights as a lead passenger?